After four years of backing up Hope Solo, the best goalkeeper in women’s soccer history, Haley Kopmeyer will assume primary duties for the Seattle Reign when its season begins Saturday. 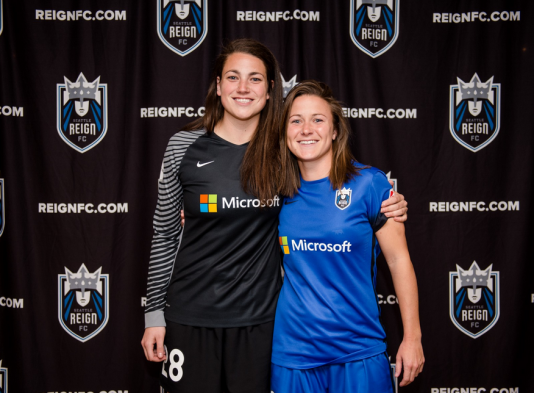 For four years, Seattle Reign goalkeeper Haley Kopmeyer played backup to USWNT legend and international lightning rod Hope Solo. As Kopmeyer enters her fifth professional season with Solo unlikely to rejoin the Reign, she is the presumptive starter as the National Women’s Soccer League club looks to rebound from a mediocre 2016 that ended in fifth place and a failure to make the playoffs after two regular-season titles in 2014 and 2015. Solo, the Richland native who starred at the University of Washington, declined to play the remainder of the 2016 NWSL season after earning a suspension from USWNT following controversial statements she made after a quarterfinal loss to Sweden in the Olympics. It appears unlikely Solo, 35, will return to the Reign in 2017, if ever. Kopmeyer sounded ready for the first home game at Memorial Stadium at 7 p.m. Saturday against Sky Blue FC. A Troy, MI native, Kopmeyer spent five years at the University of Michigan, redshirting her freshman year due to injury. In her final season in 2012, Kopmeyer kept 11 individual clean sheets, assisting two more, and was named Big Ten Defensive Player of the Year and Big Ten Goalkeeper of the Year. She was named to the NSCAA All-America second team after helping lead the Wolverines to the NCAA Sweet Sixteen. Still, the 26-year-old admits that she wasn’t prepared for the jump to professional play in the league’s inaugural 2013 season. Kopmeyer spent time playing abroad, with the Brisbane Roar in Australia and Cyprus’ Apollon Limassol on loan to gather more experience. Kopmeyer made 11 starts in both 2015 and 2016, surrendering the fewest goals each year (13 in 2016, 11 in 2015) by any keeper to make 10 or more starts. Now Kopmeyer has to hold her own against a league that strengthens its talent pool annually for a new, expanded 24-game schedule. Reign coach Laura Harvey believes that Kopmeyer is up to the task. “The fact that she’s been with us since day one, she knows who we are, what we want to be, she knows what the expectation level is,” Harvey said. “She worked with Hope for four seasons, and learned so much from that experience. It’s now time for her to put that into practice.